Pumpkin is the foundation of many Fall and Winter desserts. Think pumpkin pie, pumpkin cheese cake and pumpkin bread. Pumpkin desserts blend savory, not-too-sweet and spicy flavors in a unique pumpkin-only, comforting kind of way. This pumpkin flan is silky smooth with a kick of cayenne-seasoned toasted pumpkin seeds. I mostly follow a recipe I found in the November 2005 issue of Gourmet Magazine. I increase the quantities a bit and bake it into a 10-cup bundt pan for a beautiful presentation. Do stir the sugar a bit as it caramelizes. The caramel starts out as white, crystalized sugar, and transitions from solid to liquid, gradually darkening from white to amber to golden brown. Stop stirring once caramel begins to boil or it will become grainy. Carefully, because it is extremely hot, pour the caramel into the bundt pan. While hot, gently tilt the pan to spread the caramel as evenly as possible up the sides of the pan. The caramel will be thickest at the bottom of the pan. Do use fresh grated nutmeg. Ground nutmeg just doesn't compare. Don't skip pouring the custard through the mesh sieve, this is the key to producing the silky smooth texture. Do bake the flan in a water bath as it helps develop a consistently smooth texture throughout the flan. For the water bath use any pot that is a few inches bigger than the bundt pan. The water should come up half way up the sides of the bundt pan. Put the water bath in the oven and allow it to heat up while you prepare the custard. Be very careful when you remove the water bath from the oven as it will be VERY hot. The cayenne-spiced and salted pumpkin seeds provide an unexpected flavor kick as well as a crunchy accent that complements the smooth custard. The pumpkin seeds are pretty yummy. I make extra and use them on salads or to eat by themselves as a snack. Make this flan a day or two before you serve it as it needs to thoroughly chill. 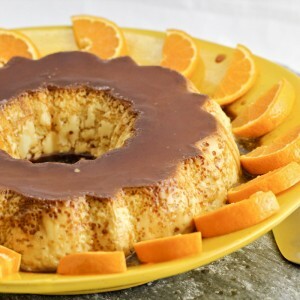 When you are ready to unmold the flan, briefly dip the bundt pan in a bowl of hot water. If needed, run a knife around the edge of the bundt pan. I use a slightly flexible metal bundt pan that I can press and flex a bit to loosten. Place a serving plate on the top of the bundt pan and quickly invert. This savory, sweet and spicy pumpkin flan is silky smooth with a kick of spicy toasted pumpkin seeds. It is the perfect make-ahead dessert as it needs to be made at least the day before you serve it. BTW, it is gluten-free. Set a water bath pan in the middle rack of the oven. Pan should be a few inches wider in diameter than the flan pan you will be using. A large roasting pan will usually do the trick. Shut oven door and heat to 350 degrees. Pour 1.5 cups sugar into a heavy-bottomed sauce pan and cook over medium heat. Watch carefully. As the sugar begins to melt stir occasionally with a clean spoon. When sugar is a deep caramel color take off the heat. Immediately pour caramel into bottom of a metal bundt pan. Swirl caramel around to evenly coat sides of the pan. Set aside to cool. Pour cream and milk into a 4-qt sauce pan and heat to a simmer. Remove from heat. In a large bowl, whisk eggs and yolks together. Add remaining 1.5 cups of sugar and whisk to combine. Stir in pumpkin, spices and salt and vanilla until well-mixed. Slowly whisk in hot cream to the egg and pumpkin mixture until thoroughly combined. Set a metal mesh sieve inside a bowl. Pour the pumpkin custard into the sieve, forcing the custard through the mesh with a wooden spoon. Pour the strained custard into the caramel-coated bundt pan. Place the bundt pan in the water bath in the oven and bake for 1 hour and 15 minutes. Test for doneness, first by jiggling the pan. The custard should be mostly firm, but have a little movement. For the final test, insert a sharp knife. The flan is done if the knife point comes out clean. Carefully remove the bundt pan from the water bath. Be careful as the water bath is very hot. Allow the flan to cool to room temperature, cover and refrigerate over night. When ready to serve, place your serving pate on top of the bundt pan and invert. Sprinkle toasted pumpkin seeds over top of flan. This flan is over the top gorgeous and delicious! 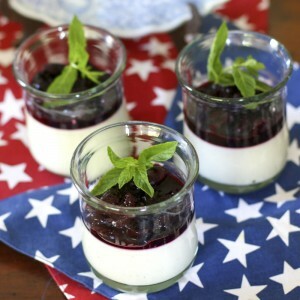 I can’t make a desert to save my life, but this recipe made me look life a chef! Thank you Kim! So glad you enjoyed it. This flan is one of my favorites Barbara. I have a huge weakness for anything pumpkin!